Fact or Fiction: Writing the family story--where are the boundaries? I never met my great grandmother but I inherited her short stories, Leaves from a Reporter’s Notebook. Her stories are dramatic and funny. I have no way of knowing if they are factual, but they are faithful to the times and worth the telling. All I know about Nellie Belle I heard from others who knew who her. I could trace some of her movements through genealogy records, but it was family legends, photographs, and scrapbooks that hinted at the drama of her life. The real story lay in what was left unsaid. I had to fill in the gaps with my imagination. Historical Fiction fans may wonder about the line between fact and fiction in this genre. Accounts of past events fall on a spectrum that ranges from verifiable reports to speculation about events that may or may not have happened. Historical fiction is subjective. Rooted in the facts of the past and grounded in the manners, mores, and details of a specific period, this literary genre allowed me to tell my story as I wished. Leora and Nellie Belle, are they the same person? 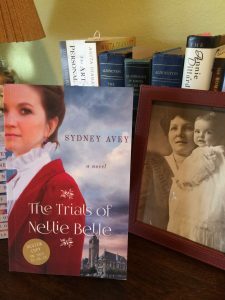 My readers ask about similarities between Leora Moraga in The Sheep Walker’s Daughter and Nellie Belle Carter Scott in The Trials of Nellie Belle. Are they the same person? Leora is an entirely fictional character. I modeled her loosely after Nellie Belle and appropriated some of the details of my great-grandmother’s life. The two share some personality traits. They both worked in the court system. They both ditched husbands but under far different circumstances. Still, it’s fair to assume they might be the same person. They are not. The Trials of Nellie Belle tells the story of my great-grandmother written in the context of four generations of women. Characters from earlier generations bear real names as they appear on genealogy charts. As the story moved closer to present times, I changed the names. Famous people whose stories are on the public record I identified by their real names. Less famous people whose stories are mostly conjecture I renamed. In these present times, the truth is a fluid concept. God, cultural norms, or individuals set the standards. Even facts are disputable. This presents a challenge to both the historian and the novelist. Historians want to animate history with a lively presentation of the facts. Novelists bury facts in the rich details that provide context for their narrative. The difference in focus produces healthy debates over accuracy. Family stories often present facts and dates that are misremembered and not always verifiable. Our relatives tell stories for effect by embellishing the anecdotes. Regardless, I believe there is more truth in a family’s mythology than we give credence. I took to heart what my mother said when she described her fractious relationship with her grandmother Nellie Belle and then told me I was “just like her.” It was eye-opening to discover that the women in my family all display Nellie’s attributes to some degree. Respect for education; a facility with language; a killer work ethic; a fighting spirit; a love for beauty and nature; belief in the value of family ties; and a sense that we are not alone in the universe–we are part of a larger plan. These characteristics work both for and against us, as I have tried to show in The Trials of Nellie Belle. Writing a family story is like working a puzzle. 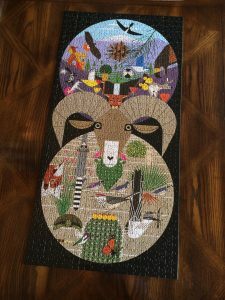 Recently, I linked most of the pieces in a puzzle, but a handful remained. I could not make them fit. A black border framed the image, and it fought me. In an exercise of trial and error, I reworked sections. A few critical pieces fit more that one place! To create the whole, I had to work in the dark areas without a clear image to guide me. The family story is like that puzzle. Some facts seem to make sense, but when you put them together, there are holes in the story. A writer uses the imagination’s creative power to explore alternative ways of arranging the pieces. In the process, she unearths possibilities that produce a story that rings true. Do you have an ancestor whose life would make a good book? Please reply to this blog and tell me a bit about that person in the comment section below. Great thoughts on writing historical fiction. I especially loved these lines: “To create the whole, I had to work in the dark areas without a clear image to guide me. And: “Some facts seem to make sense, but when you put them together, there are holes in the story. A writer uses the imagination’s creative power to explore alternative ways of arranging the pieces. In the process, she unearths possibilities that produce a story that rings true.” Can’t wait to read the Book and see how you put it all together! Thanks, Marie. You are doing a beautiful job on your work. I listened to the YouTube. You have a lovely reading voice and the way you share your research (photos) in the accompanying slideshow is inspiring.